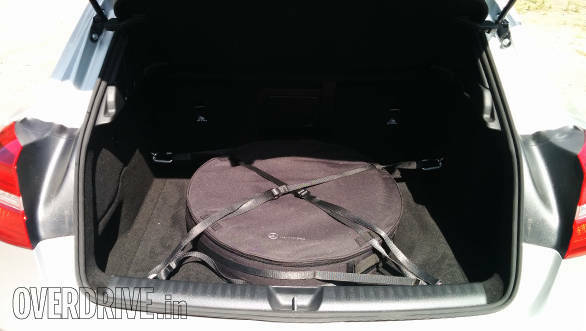 You've already seen the new MFA platform in Mercedes' hatchbacks, the A-Class and B-Class. Mercedes also recently launched the AMG version of their compact sedan - the CLA 45 AMG. Well now the fourth body form is here. Say hello to Mercedes' compact SUV - the GLA. 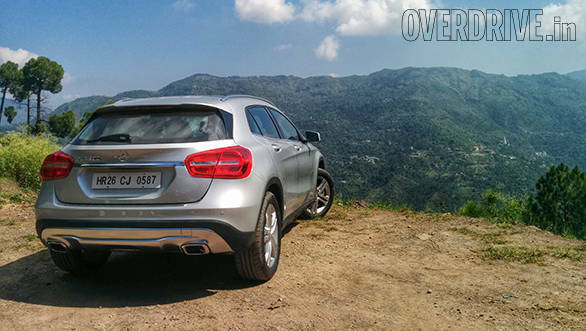 But then calling the GLA an outright SUV would probably not be doing justice to other capable Mercedes-Benz SUVs. The GLA is at best a crossover if you don't want to call it an overgrown hatchback. Don't believe us? Well the dimensions don't lie. The GLA is shorter in length and width than the CLA sedan and is only about 59 millimetres taller than the A-Class. Nonetheless it is a striking crossover. Instead of giving it the brutish and butch SUV looks of the ML and the GL, Mercedes has bestowed it with gentler curves and suave styling - much like the other MFA platform cars. In fact the MFA is just one good looking family all round. The interiors follow the same theme as the rest of the MFA cars and are almost identical to what you get in the B-Class as well. Slightly less affluent than the A-Class we think. So you're not getting anything different, but lessons learnt from this segment dictate that people don't necessarily want different as long as they get good quality in finishing and materials, and ergonomics. And with this interior, you're not going to have too many complaints except perhaps the infotainment screen which just doesn't seem to gel with the design. This one is smaller than the one on the A-Class petrol. It's the same grouse we've had with all Mercedes-Benz compact cars. Mercedes, its about time. Just change it. 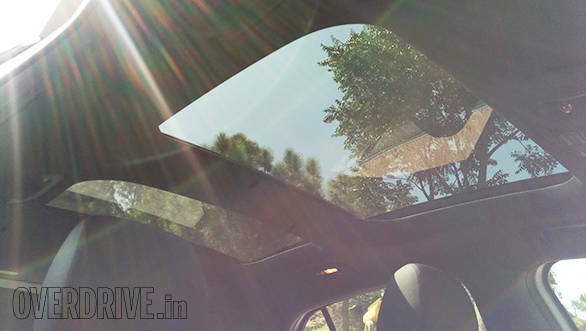 Now one thing that we love about the GLA is that it might not be very spacious but it gets dual sun roofs that give it a sense of being airy and thereby the perception of more room. And it has a cool feature where it shuts automatically when it senses that it is raining. The GLA also has a substantial boot with 421 litres of storage but with the space saver tyre it gets significantly compromised. And that is because under the boot floor, instead of a housing for the spare, lies nothing but the tool kit and a storage space. But the good part is that the loading area is quite low and wide. In India the GLA will only come in the avatar of the GLA 200. It gets the 2.1 litre diesel engine but in the lowest state of tune from all the international variants at 134PS. The petrol variant gets an all new 2.0 litre turbo petrol that makes about 181PS. 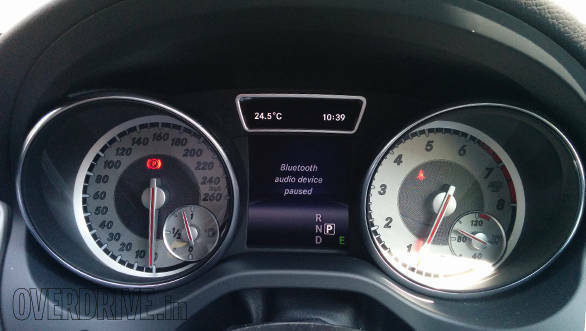 Merc claims that it will hit 100kmph in 7.6 seconds. 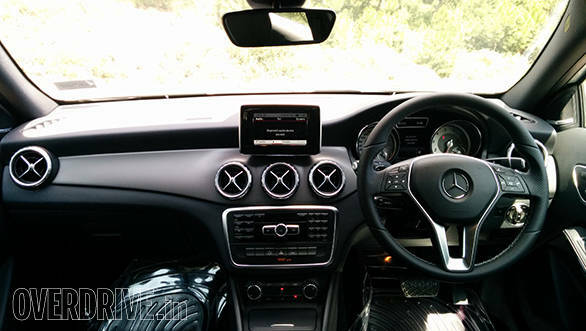 Both the petrol and diesel engines are mated to a 7-speed dual-clutch automatic gearbox. For most parts it is a clever gearbox. If you drive along under normal acceleration and braking, it is amicable and seamless but the moment your actions get frantic, it starts to show inadequacies. Shifting isn't as accurate as you'd expect from a DCT gearbox and that we think is due to this somewhat odd spacing of gear ratios. Downshifts are quick but upshifts take their own sweet time. The CDi is likely to be the more popular choice of engines - it boasts a company claimed fuel efficiency figure of over 17kmpl thanks to fuel saving technologies like start stop and Eco mode. But if you're a driving enthusiast, the petrol will definitely keep you happy. It's peppier than the A-Class for sure. But if happy isn't enough, and you want ecstasy... we have good news. Mercedes-Benz have just revealed to us that next month they intend to launch the GLA 45 AMG and that changes everything. You've read about the CLA 45 AMG on Overdrive, now imagine that tenacious 4-cylinder turbo engine on this brute, with the AWD system. That could be more rapid than many super car on our roads. If you want the benchmark in terms of handling from an SUV you'd probably think of the Porsche Macan. But considering the GLA will probably be priced at much less than half the Macan's price, you'd say that the GLA gives you more bang for the buck. But when you compare it to the A-Class, the added ride height raises the centre of gravity a bit, and the suspension travel is a bit more so it doesnt quite feel as planted when you throw it in a corner. There's relatively more body roll but nothing like the big Mercedes-Benz SUVs. The more powerful petrol also exhibits torque steer when accelerating hard. In a first for Mercedes-Benz India, the company managed to convince the global headquarters in Germany to have the suspension raised even more for the Indian market. And so the ride height has been increased from to 183mm, up by 30mm specifically for India. This is the highest in its class. 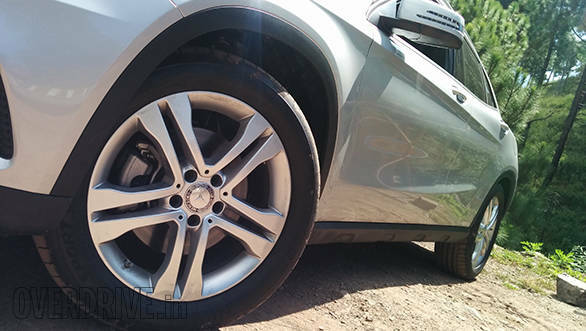 What's more India also gets 18-inch wheels as standard instead of the 17-inch ones offered in other markets. which is surprising considering larger wheels would naturally affect the ride quality. But the ride quality is significantly better than the A-Class. This is what the A-Class should have felt like. Vertical travel is more and it is basically a stiff suspension which is softly sprung but not enough to affect the dynamics too much. The GLA sits tall enough for it to not be bothered by anything on our roads, you can be sure of that, but then don't go about giving it articulation tests. 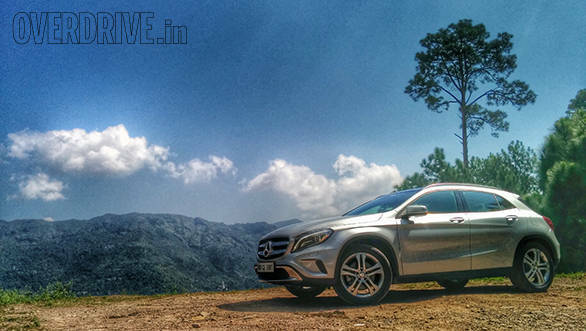 Neither does the GLA 200 get the 4 matic AWD system, India will only get the GLA in a front wheel drive form. So we wouldn't call it an offroader, its more of a soft roader, with significant street presence and enough ground clearance to not have you bothered. There is no doubt about one thing though. The GLA will be one of the safest vehicles on the road when it is launched. It's because not only are there a host of driving aids to prevent you from losing control like hill assist, traction control, anti skid and so forth, it also gets not two, not four, not six but seven airbags as standard in case you do lose control. In theory, the platform sharing ought to give you an economy of scale that would lend the MFA cars a lower price of entry for customers. Mercedes have been able to do that with the A-Class and the B-Class. But this time it's the body form that India simply loves. And quite frankly who really minds platform sharing when the product of it looks like that! This is a very high priority product for Mercedes-Benz, not just in India but globally as well. But the pricing will be key, considering that there is no base or stripped down launch variant, and Mercedes Benz are not as inclined to be that aggressive with the pricing. Whether this move works, we shall find out once the car and its prices are launched on September 30th. Expect a price starting at Rs 30 lakh for the new GLA, which is roughly seven lakhs more than the A-Class.